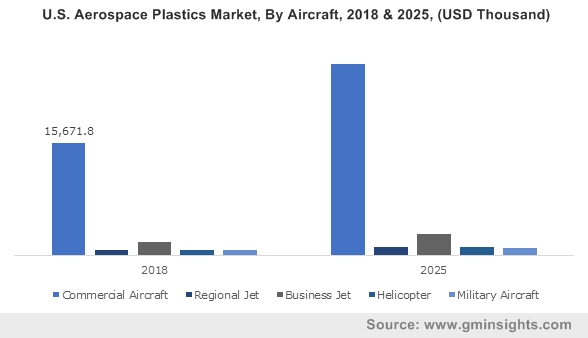 Global Aerospace Plastics Market is likely to exceed 140 kilo tons by 2022 with an estimated CAGR of above 12%. Increasing lightweight construction demand in order to improve aircraft fuel efficiency and performance is likely to drive aerospace plastics demand. Reduction in aircraft weight proves to be beneficial for operating life. Weight reduction has given a major boost to the development of composites required for military applications. Surveillance aircrafts can have maximum airtime which is controlled by remote. Composite materials such as CFRPs (Carbon Fiber Reinforced Plastics) are one of the key product available in the industry. It has got excellent strength compared to that of steel and is lightweight. They are also used in military applications as they are not easily detected by radar. Boeing 787 consumes over 50% of the aerospace plastics with respect to its overall weight. CFRPs have toxicity issues along with high production cost which may affect aerospace plastics market growth. CRPF emits more GHG emissions compared to counterparts. It manufactured by engineering two or more materials together which increases the production costs. Airframe & fuselage application was the largest with market revenue exceeding USD 2.2 billion in 2014. It contains higher amount of composites and CFRPs and efficient helps in weight reduction in comparison to other aluminum products. It also helps in cost cutting for reducing the usage of nuts and fasteners, which helps in reducing overall operational costs. Flight deck & cockpit based application accounted for over 15% of the total demand in 2014 and are likely to witness significant growth pattern up to 2022. Compliance with FST (Fire, Smoke and Toxicity) regulations are to be followed for product usage in this application. Commercial and freighter aircrafts market size was the dominant with valuation more than USD 5.6 billion in 2014. Aircrafts manufacturers are increasingly using polymers in order to reduce overall weight and improve fuel economy. General aviation accounted for over 10% of the total demand in 2014 and is likely to witness moderate growth pattern over the forecast period. Business jets are exclusives used for travelling and is on the rise. This factor is likely to assist aerospace plastics market growth over the forecast period. Europe aerospace plastics market size, led by Germany, UK and France, was the dominant and is likely to witness significant growth. Europe is one of the leading regions owing to established engineering practice in the region, which is likely to drive industry growth. Global aerospace plastics market share indicates consolidation with top four players serving to more than 67% of the total demand in 2014. Toray Industries led the market share as it supplies product and materials to leading aircraft manufacturers such as Airbus and Boeing. Key companies in this industry include Hexcel, Mitsubishi Heavy Industries, Cytec Industries, Ensinger, HITCO Carbon Composites, Kaman Corp, Composite Holding Comp and Hyosung Corp.
Other major industries include Tech-Tool Plastics., Toho Tenax, Premium Aerotec Zoltek and Saudi Basic Industries.